An oldskool classic now available in auto-flowering! This strain was created from the offspring off a specially selected oldskool skunk. Selected for its lemon fragrance and substantial yielding, this strain was then crossed with an original Lowryder #2. Lemon Skunk Automatic is a short plant that develops fast. The strain itself is relatively easy to grow and produces a good harvest of bud that has a pungent aroma of over ripe lemons... This one is more about the finished article rather than quantity. 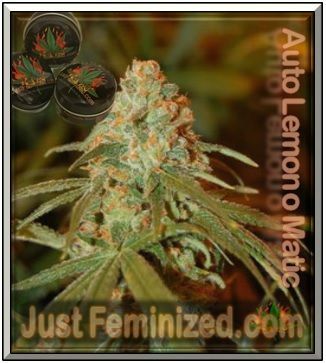 Auto Cannabis Strain Lemon O Matic Skunk is a mixed Indica and Sativa and Ruderalis hybrid with great potential to perform to high standards in any garden. This marijuana strain will flower automatically and finish with a reasonable yield of slightly lower potency buds of a citrus lemon fragrance and taste.